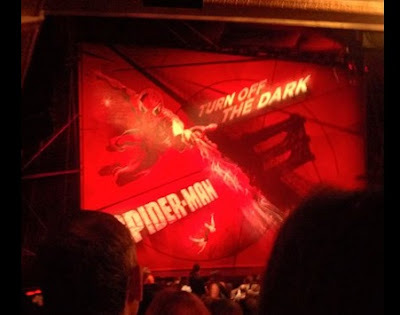 There hasn't been a more publicized play production in several decades than Spider-Man Turn Off The Dark, the struggling creation of Julie Taymor with music from Bono and The Edge. Taymor was recently let go from the production and large chunks of the musical were re-written and tinkered with. The play has received mixed reactions from critics and some criticize the massive 60 million dollar budget. Despite all the hype and negative feedback, I felt like this was a one-time chance to see this thing as I went to New York City over the weekend with my girlfriend. After paying $15 for a special Spider Man mixed drink (by the way, you CAN bring food and drink into plays these days - I so did not know that), I took my seat and right off the bat I could tell this was a Bono/Edge production. The Edge's signature guitar tones are omnipresent throughout the muscial and really help set the atmosphere. The story is one we all know from the first Spider-Man film. Peter Parker is a photography nerd that digs Mary Jane. He gets bitten by a radioactive spider, gets confronted by his nemesis The Green Goblin and eventually saves the day and gets the girl. If these pieces of information are spoilers for you then you probably wouldn't be interested in this musical in the first place. The real draw and spectacle of this show is the production value. Sets are very intricate and the transitions from scene to scene are seemless. The aerial action is incredible and there are even times when Spidey/other characters touch down in the middle of the audience in the orchestra section. A particularly genius set confines Peter Parker to a small comic book styled room in which he realizes he has super powers. Parker is seen crawling and bouncing off all four walls as stage hands position the walls to propel him around the set. The rigs and harnesses really do give the effect of flight and the wire work is the best I've ever seen in a stage performance. The art direction gives a sense that the play was pulled directly from a comic book especially in the final scene that shows a NYC building in perspective as if the audience is looking at the tip of the building down to the street. As evidenced by the escalating budget, the production team really did spare no expense in building the Spider-Man world of New York. We ended up getting discounted tickets but unfortunately were placed in the back of the first level orchestra section. Seeing the stage was easy (see the pic above), but we ended up missing small parts of the high-flying action in the second act. If you go I would recommend sitting outside of the 2nd level overhang so you can see everything that goes on in the air. And yes, I DO recommend giving Spider-Man a try if you go to NYC. This is one of the more entertaining plays I've seen in a while. If you're looking for memorable lyrics or outstanding acting performances then you're heading into this with the wrong expectations. It's not a perfect play and won't win any Tony Awards. At its core, the musical is simply a unique and energetic stage performance that features just enough clever hooks by two members of one of the greatest rock bands of my generation. Well worth the price we paid and not at all the bust that critics are making out to be. So for my first ever play review on this blog, I give Spider-Man Turn Off The Dark 4 out of 5 JRs. It's my understanding that the play you saw is not (exactly) the play that's been catching so much hate. I'm pretty sure I read that it gotten a lot of heavy work post- those early nightmare reviews. Yeah, I'm sure the original version was much less enjoyable. That's why they have a preview run I suppose. I recommend purchase an annual pass. I buy one just about every year and it pays for itself in about 4 or 5 visits, depending on which report you get.